Mark H. Ebell, et al. Top 20 POEMs of the Past 20 Years: A Survey of Practice-Changing Research for Family Physicians. 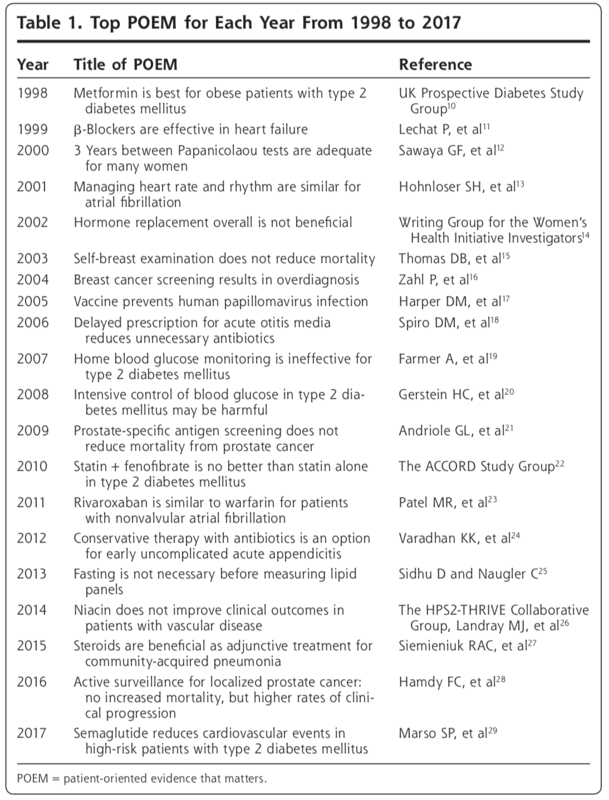 ANNALS OF FAMILY MEDICINE. 2018; VOL. 16, NO. 5 SEPTEMBER/OCTOBER: p436-439. (3) those that recommend abandoning a potentially harmful practice. We observed greater challenges in choosing the best POEMs in recent years, largely because it is difficult to know whether a 3-year-old study will withstand the test of time and the rigors of replication in real-world settings. This judgment is even more difficult because of the increasing amount of industry-sponsored research published in journals and the relatively small amount of public funding for research to support the study of real-world problems in real-world settings. It would be difficult for any clinician in any specialty or discipline to read all of the journals publishing studies of potential importance, not to mention critically evaluate the validity of individual relevant articles. Clinicians regularly reading POEMs can confidently change practice with the knowledge that they are using the very latest, most relevant, and valid information to provide for the very best care for their patients. The current POEMs are oriented toward primary care, including obstetrics and general hospitalists. We hope to encourage the development of POEMs for other specialties and disciplines in medicine, as well as such other health care disciplines as dentistry and veterinary medicine.